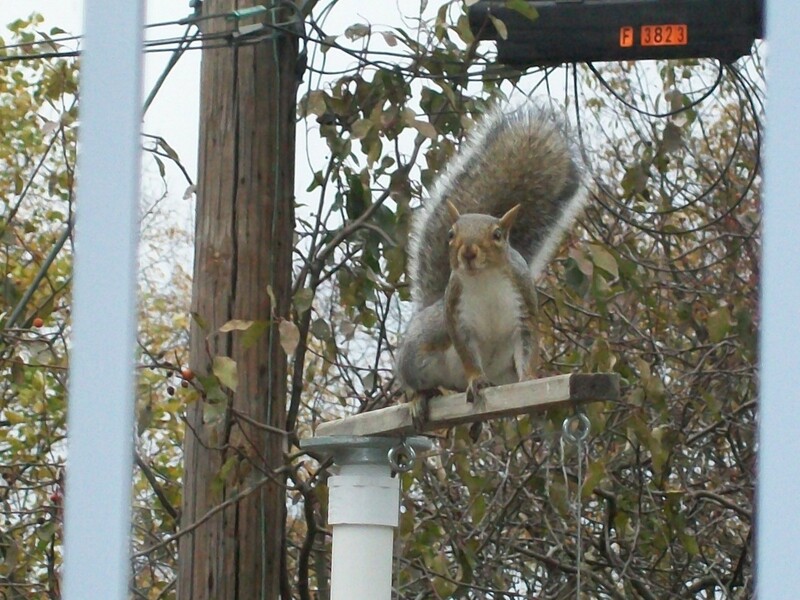 Squirrels can raid your birdfeeders, keeping the birds away from your yard. 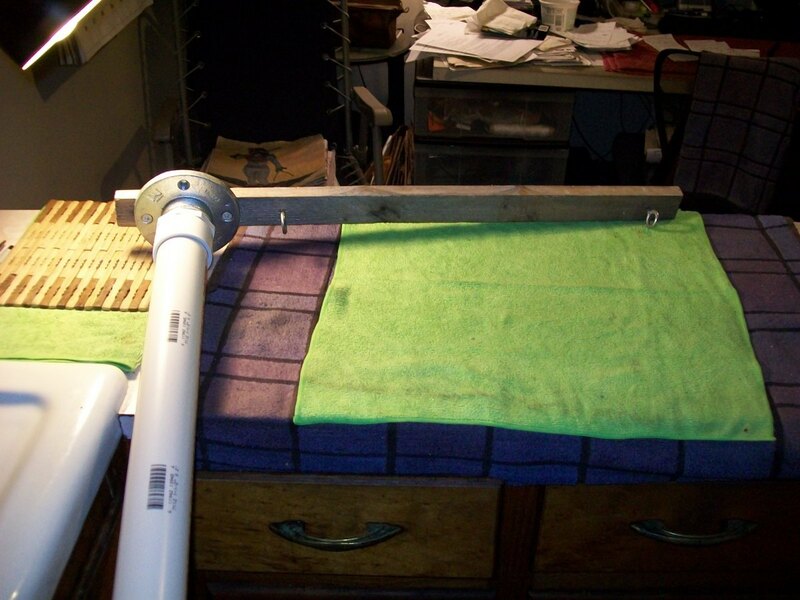 This is a guide about making a squirrel proof songbird feeder. I felt challenged by all the news I've read where squirrels defeated imaginative defenses invented to keep them from raiding bird feeders. So I put my construction experience to work. Total bill for parts was about $25. For the mast I bought schedule 40 1-1/2 inch diameter PVC pipe. Schedule 40 is one of the top quality grades of PVC - very hard and dense. Hard enough to prevent squirrel claws from gaining traction. cast-iron flange for the top to connect the anchor support arm to hold the feeder pan. I already had the appropriate adhesive and cleanser for the pipe joints. I used a scrap piece of 2x2 softwood lumber for the support arm. I used 1/16th inch steel cable and ferrules to make loops for easy disconnections for when it's zero degrees outside when pan has to be cleaned and such other nasty winter conditions. I ran the cable through two screw-eyes to distance the pan from the mast. I used cheap carabiners from Walmart to connect the parts. The project was built with only basic tools - none expensive or exotic, believe me. Only one (that I know of) extremely smart squirrel ever made it all the way to the top -- and he never got close to the seed pan. I know he didn't use his claws to get up there -- I like to think he "hugged" his way up -- like I used to 'shinny' up trees. He looked a bit foolish and ungraceful when I chased him away. 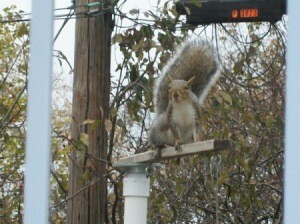 After all, I had another feeder nearby just for squirrels. But they like sunflower seeds just as much as the birds do. 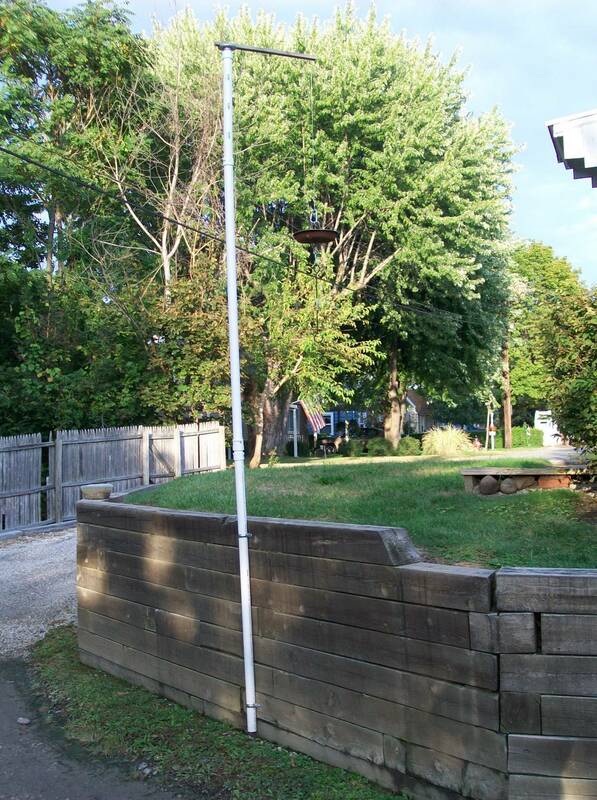 I am fortunate to have a handy timber retaining wall to anchor the mast to. The seed pan ended up suspended less than 8 feet from my living room window so I got lots of picture opportunities - not to mention all the pleasure watching the different breeds feeding so close to my window. 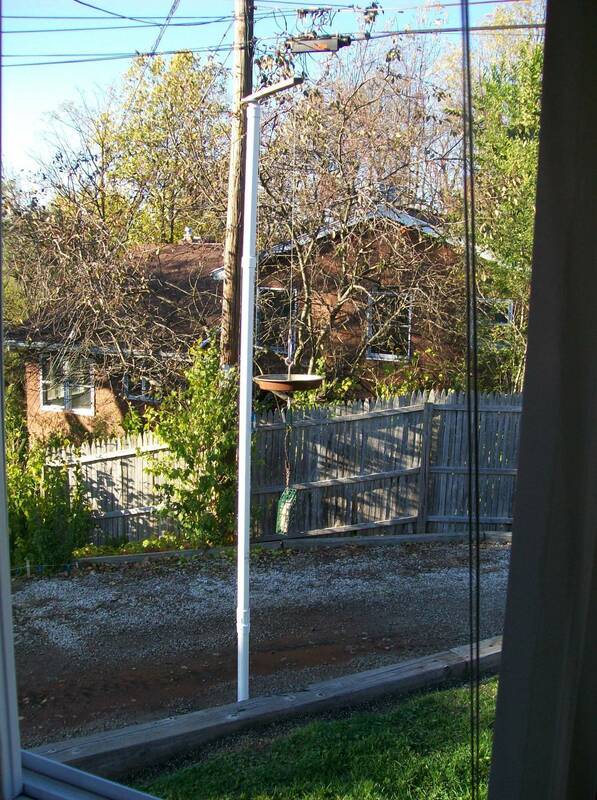 I would like to make a long arm bird feeder hanger from PVC pipe. First off, is the pipe strong enough to hold a feeder if it's reinforced somehow? Second, how do you make one? I have a bracket from the side of the window on the house, but it doesn't go out far enough and the squirrels can still jump from a small roof to the feeder. I want it to go farther out in front of the window so it is impossible for any squirrels or other critters to get the feeder. Does anyone know how or if I can make one of these? I'm not looking to building a feeder as I already have one. I want to build a long arm, like the swing arm ones that extend out about 20" or more to hook a feeder on the end.